When you're planning your wedding, you stress. It's true. I wish I could say that there wasn't a single time when my frustration got the best of me, but I can't. I told myself I was allowed to have one terrible wedding planning meltdown ... and I did. But to keep yourself sane, you have to take care of yourself too. You need to carve out time to just breathe or take a walk or hang out with a bridesmaid and listen to her talk about her life and you have to curb the wedding talk. And sometimes, you have to take care of your fiance too. Because as hard as it is for you to stress over chair covers, it's hard for him to sit back and watch you stress, knowing he can't do anything about it. So maybe, just maybe, serve him breakfast in bed. 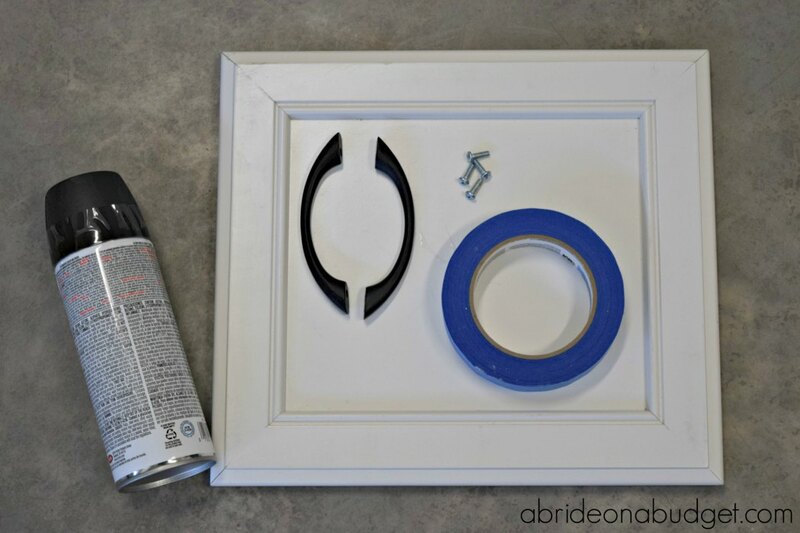 And you can totally serve it on a DIY Chalkboard Serving Tray. I actually upcycled this from an old cabinet door. It's the first time that I tried a project like this, you know, one using tools all by myself. As I'm typing this, my arm is still kind of sore. But I'm so incredibly proud of myself ... so much that I think I'll serve myself breakfast in bed on this for the next week or two. Wash and dry the cabinet door first. You want to make sure that any dust or oils (from touching it) are completely gone. 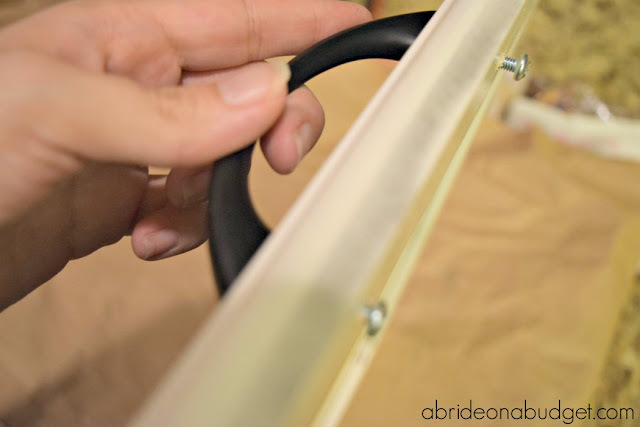 Use painters tape to line around the inner portion of your door. It was easier for me to cut the tape into very small pieces when I was doing the first row. I was able to be more accurate with my placing. Then, cover the rest of the outer "lip" of the door. Continue covering until the only white space showing is what you want to be spray painted. Bring your cabinet door outside and set it on a piece of scrap paper. 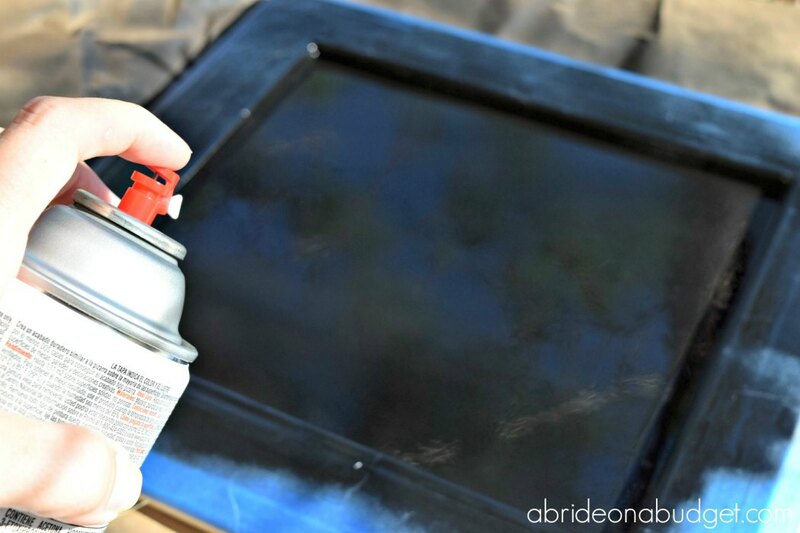 You absolutely don't want to spray paint indoors. You also probably want a barrier between you and whatever surface you are spraying over. I usually go into our woods to spray paint so the only thing under me are pine needles, but I still put down the scrap paper anyway. Spray one even layer of the chalkboard spray paint. You'll need to let this sit fifteen minutes before you can spray another layer. I used this as a time to call my mom and see if she wanted to take a walk down the block with me. That was a lot more fun than sitting and watching paint dry. Come back and spray a second layer of spray paint. Now this needs to sit for 24 hours before you can do anything else. After a day has passed, peel off the painter's tape. 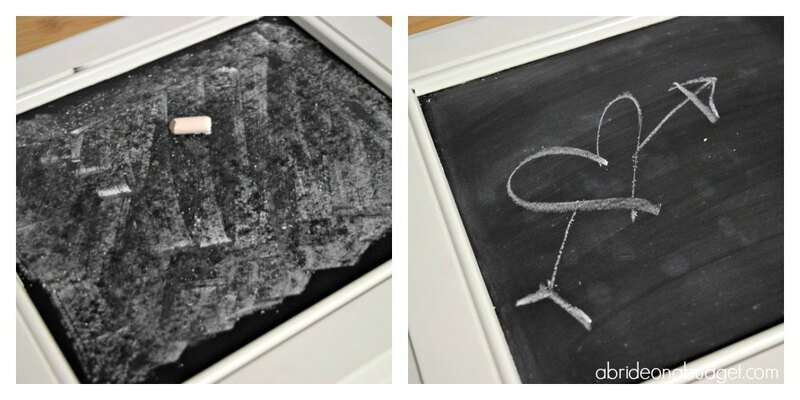 Color completely over the chalkboard surface with a piece of chalk, then wipe it away. Woohoo. You have a chalkboard now. 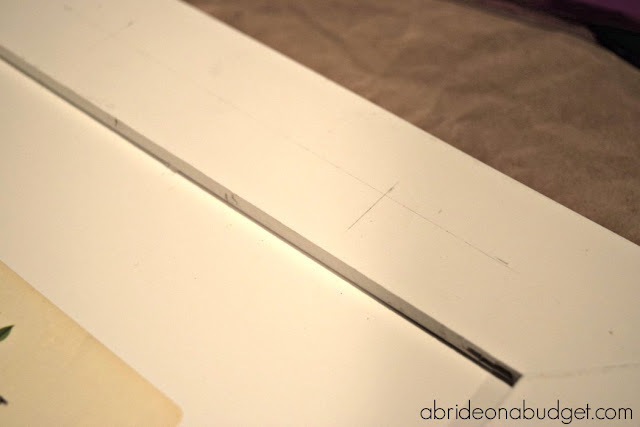 Measure exactly where you want the handles to go and mark them with an "x". Here's the hardest part, if you're like me and not very versed in power tools. 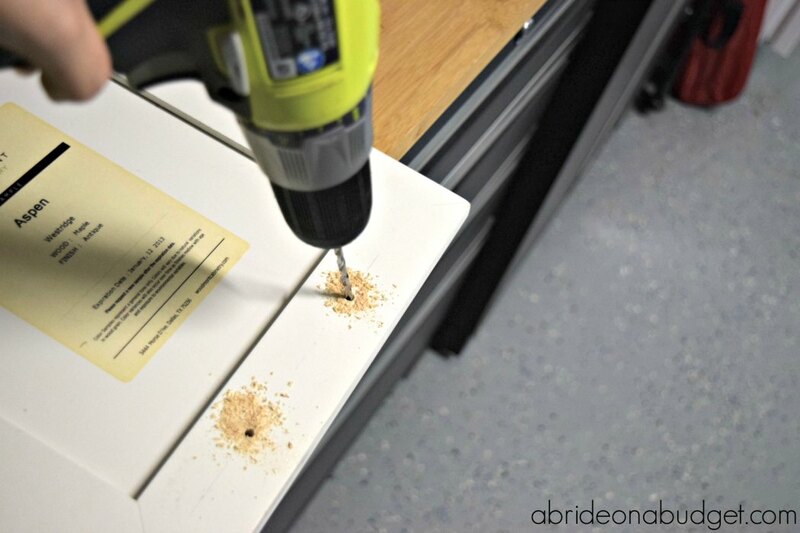 Using the drill, drill a hole completely through the "x". Repeat this four times. Small aside: you want to put your cabinet door on a flat surface, overhanging it. Your drill needs to go all the way through and you don't want to put a hole in whatever you're leaning on. Also, if you are holding your drill straight down, your hole will be straight as well. Then, put a screw into a whole and screw it up almost all the way through. Pete told me you could use the drill to do this as well, but it wasn't working for me, so I did it with a screwdriver. That's why my arm is killing me (and why I should probably do more than walking as exercise). When the screw starts popping through the wood on the other side, fit it into the hole in the handle. Continue screwing until it is secure. Now comes the easy part: figuring what to serve for breakfast. If you know me, you know my love of coffee. I'm obsessed. I'm drinking a tremendous cup right now (picking it up with the opposite hand of the one that worked the screwdriver). My current coffee obsession is a good cup of caramel coffee. Oh. My. Gosh. For a long time, I wasn't a fan of flavored coffees. I was just a plain and simple flavor free coffee drinker. A friend told me to try caramel and I was hooked. 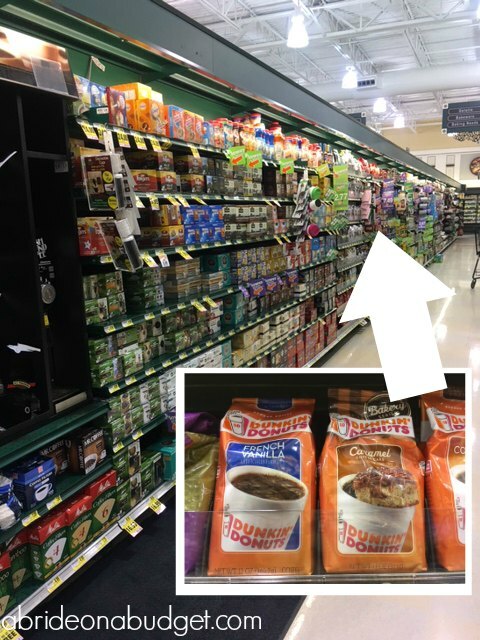 So imagine my excitement when I found our Harris Teeter has Dunkin Donuts® Bakery Series® Caramel Coffee Cake in stores. Oh hello new favorite! 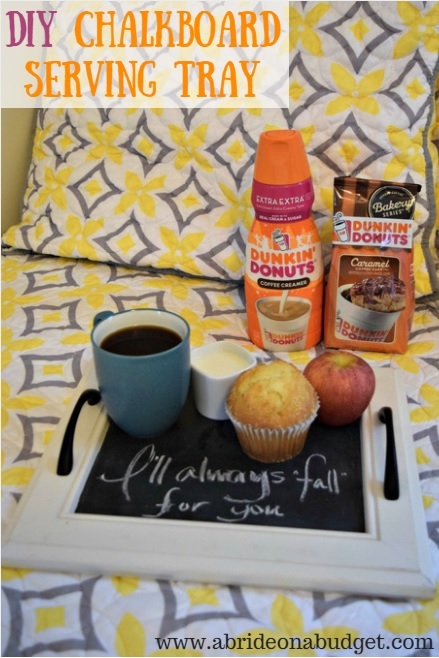 Pair it with the Dunkin’ Donuts® Coffee Creamer in Extra Extra (because we all deserve a little extra in our lives) and you have the perfect cup. 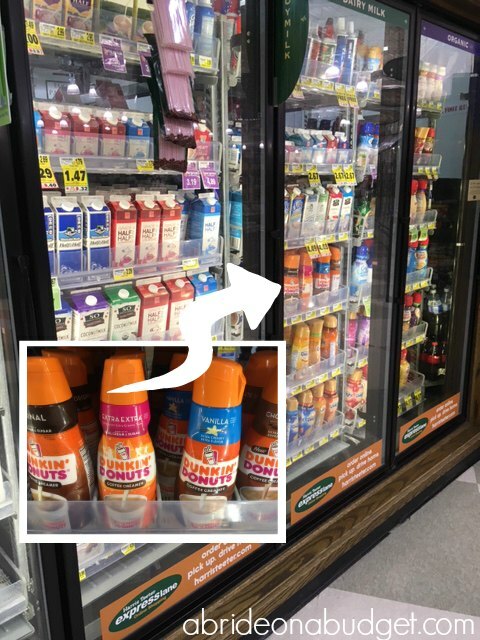 Plus, you can also pick that up at Harris Teeter, making it one-stop shopping. Coffee isn't enough for breakfast, so be sure to fill your serving tray with other goodies, like a muffin and fresh fruit. And, since you are serving it on a chalkboard, be sure to leave sweet notes on it, especially if you're bringing your fiance breakfast in bed. You can make them wedding related, like, "Can't wait to marry you in 200 days" or timely with "I fall for you every day." 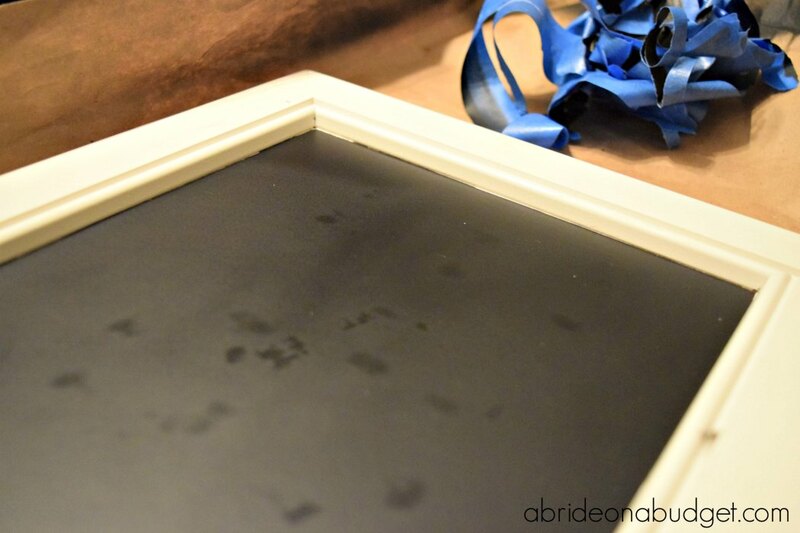 BRIDAL BABBLE: What would you write on your DIY chalkboard serving tray? This is the most adorable thing ever. I would love to make my own serving tray that is chalkboard. Would make fun to write little things on it for the kids. This seems like such an easy craft, but it is something that can really makes someone’s day! I would love to make this with my daughter, it would be a fun gift for my mom. That turned out so cute. I love chalkboard everything. It is so much fun to personalize. Every month I say I'm going to practice with a power tool and I haven't done it yet. I'm hoping some of your fearlessness will rub off on me. This is a great project and post. Thank you for sharing with us this week at Celebrate Your Story, have a great week. This is a very cute and creative idea! I'd have never thought of making my own trays like this. What a sweet idea. Great wedding gift too!